Inflatable boat repair accessories, parts, fabric, paint, sealant and much more. Inflatable boat repair accessories, parts, fabric, paint, sealant and much more. 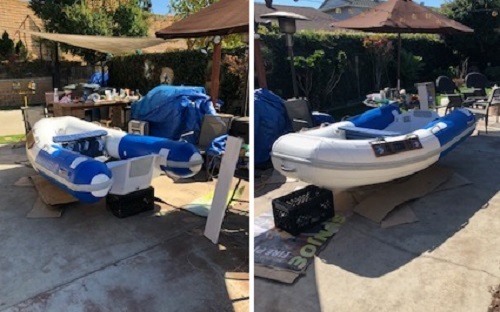 These inflatable boat and zodiac dinghy repair accessories include repair products, patch kits and glue, PVC and hypalon fabric, inflatable boat paint, internal leak sealer, launching wheels, and others. See them all below. Rename or apply a custom message to your dinghy. Safe for all PVC and Hypalon fabric. The number one product for cleaning inflatable boats.